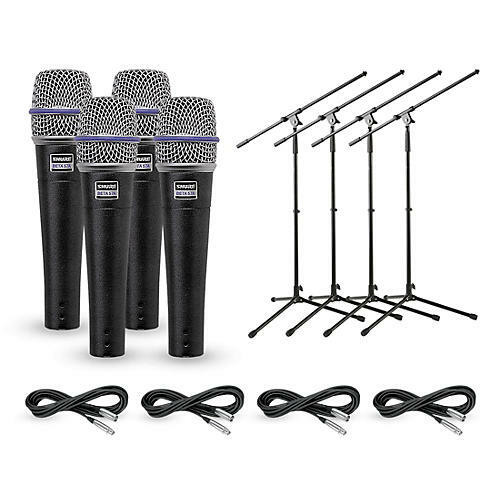 This Shure mic pack gives you 4 Shure Beta 57A dynamic microphones with 4 cables and 4 stands. It features the versatile Shure Beta 57A dynamic mics, and includes 4 Musician's Gear tripod mic stand with fixed booms to hold them and a quartet of 20' Gear One XLR microphone cables to get you plugged in. The Shure Beta 57A microphone improves on the design of the popular Beta 57 to optimize warmth and presence. Many leading performers use the Beta 57A mic to capture drums, guitar amps, brass, woodwinds, and vocals. An excellent supercardioid pattern gives superior gain-before-feedback across its frequency spectrum. The grille is hardened for longer life and designed for close placement to enhance low-frequency proximity effect. A high signal-to-noise ratio is achieved through use of a neodymium magnet structure, an internal shockmount decreases handling noise. The MS-220 tripod microphone stand has a thread adapter and tubular legs. Its adjustable height from floor to top thread is 35" to 61-7/8". The 30-1/4" fixed boom is not adjustable.